The fourth stage of the oil field life cycle is to define the prospects that are worth drilling. Defining prospects generally involves a synthesis of the preceding work and incorporates structural seismic interpretation to produce a prospect inventory. 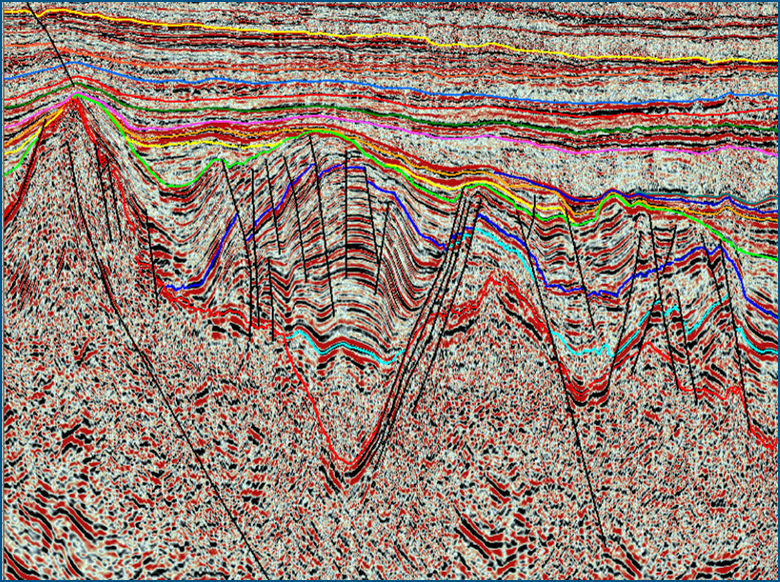 TGS interprets vast quantities of 2D and 3D seismic data each year to define regional surfaces and individual prospects and also has an extensive database of complete petrophysical analyses for wells throughout its study areas. In areas of little information or low confidence, a feature may be known as a lead. Where more data has been acquired and the feature is more robustly defined, it is known as a prospect. The risk associated with each lead or prospect will be dependent upon both its location within the play fairway and the trap definition. The trapping mechanism could be structural, stratigraphic or both. Structural features are more readily defined and include simple anticlines; subthrust or tilted fault block. Stratigraphic features are more difficult to define and generally require a particular facies to pinchout. The risk associated with the trap will heavily influence the overall risk of the prospect. Seismic data interpretation is used to reduce the risk associated with the trap. The size of a prospect will be dependent upon the areal extent of the trap and on the expected reservoir properties encountered. The reservoir properties are usually calculated from analog or nearby by wells. This data comes from a petrophysical analysis of the well data to define the net rock volume, porosity, permeability and water saturation of the hydrocarbon bearing interval.